In 1994, Rock Valley College Continuing Education could not keep up with the demand for computer classes as the technological revolution was threatening to leave many workers behind. An Associated Press poll at the time showed that 42 percent of Americans were not satisfied with their level of technical know-how, and 46 percent felt they were being left behind as technology developed. In 1994, RVC offered 12 community and continuing education computer courses, ranging from word processing to spreadsheet instruction. For the spring 1994 semester, 480 people were registered for the four-hour introductory computer class. 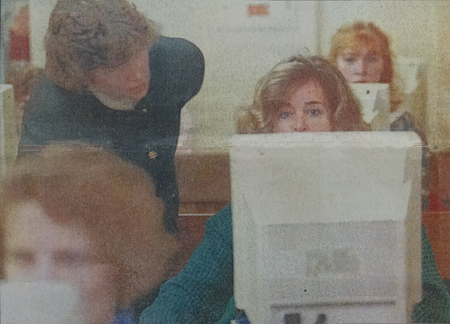 Instructor Katheryn Heyer (left) assists a student in a computer course at RVC in 1994. On May 4, 1994, President Bill Clinton signed the School-to-Work Opportunities Act (STWOA). RVC President Dr. Karl Jacobs and three manufacturing apprenticeship students from RVC’s Tech-Prep program were invited by U.S. Senator Paul Simon, chief Senate sponsor of the bill, to witness the signing in-person in Washington, D.C. The three students, Steve McDonald, Jennifer Mandujano and Erika Felker, all from Harlem High School, joined over 40 other students from across the country who were invited to witness the bill signing. The purpose of the bill was to encourage school and business partnerships nationwide. At the time, RVC’s Tech-Prep program was based at Pfauter-Maag and was coordinated by RVC and Career Education Associates of North Central Illinois (CEANCI). RVC’s program had previously won three state awards, including the Building (gender) Fairness award, the Excellence in Workforce Preparation award, and a Business-Education Partnership award. It was also featured in Industry Week magazine and Senator Simon cited the RVC program as an example of the benefits of school-to-work programs. 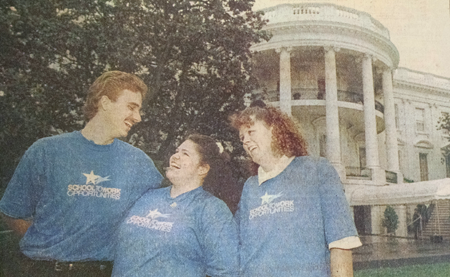 Students , Steve McDonald, Jennifer Mandujano and Erika Felker from RVC’s Tech-Prep program on the White House lawn on May 4, 1994. 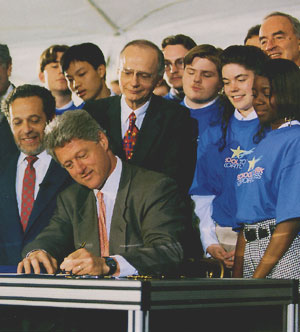 President Clinton signing the School-to-Work Opportunities Act on May 4, 1994. The Valley Forge, Rock Valley College’s student newspaper, won a first place award from the American Scholastic Press Association in 1994. Judges stated that the Valley Forge “shows a tremendous amount of time, energy and talent by editors, writers, photographers, page designers and advisers.” The Valley Forge editor said that the paper’s goal was to inform readers and address controversial issues in a fair and accurate manner. 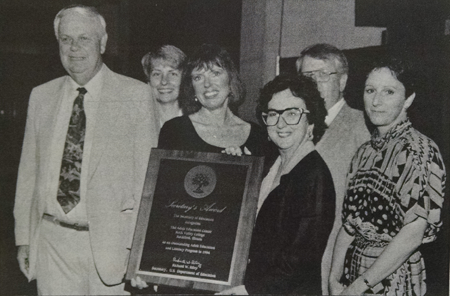 Rock Valley College’s Adult Education Center was the recipient of the U.S. Department of Education’s Secretary Award for Outstanding Adult Education Programs in June of 1994. RVC’s center was recognized as having the fourth largest Public Aid reduction in the state of Illinois as 63 program participants were either taken off Public Aid altogether or had a reduction in their benefits, resulting in a $265,092 annual savings to Illinois taxpayers. Additional accomplishments RVC were recognized for included a 61 percent increase in participants- from 1,335 to 2,152 students, and an increase of 117 percent in GED graduates- from 185 to 402. The award was presented by Betty Duvall, Community College Liaison for the U.S. Department of Education. From left: Dr. Karl Jacobs (President, RVC), Noreen Lopez (Illinois State Board of Education), Diana Barthelman (Director, RVC Adult Education Center), Betty Duvall (U.S. Department of Education), Randy Sturm (Chair, RVC Board of Trustees), Kathleen Oglesby (Illinois Community College Board). From June 16 through July 11, 1994, Rock Valley College retired history professor Norman Kearney and RVC history professor Wilbur Johnson led an archaeological dig in Israel. They led a Rockford group, ranging in ages from 17 to 81, on the dig where they joined forces with James Strange, a noted Biblical archaeologist who had been excavating at Sepphoris- a major Roman site- since 1983. Kearney and Johnson worked for four years to organize the trip. Kearney explained, “We’re the only junior college in the U.S. that has ever done this.” Kearney and Johnson later presented a program on their adventure as a First Tuesday Lecture on October 4, 1994. 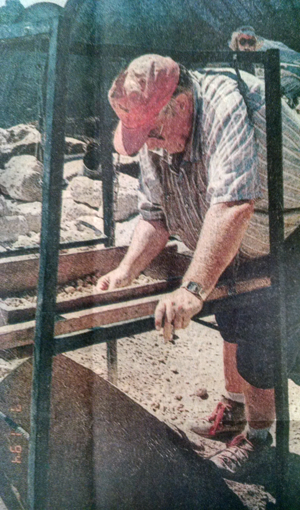 Wilbur Johnson sifting for Roman coins on the archaeological dig at Sepphoris in the summer of 1994. Rock Valley College’s Studio Theatre attracted national attention when the original musical American Rock! opened on December 1, 1994. American Rock!, celebrating the 100th anniversary of Norman Rockwell’s birth, was “a musical walk through the work of one of America’s most beloved artists,” according to director Mike Webb. The play was written by Jane Ellen Murray with music and lyrics by Roger Pauly. Broadway producer Rocco Landesman, Rockwell’s son Tom Rockwell, and a representative of famed Broadway producer Steven Sondheim were all expected to attend the premiere at RVC. 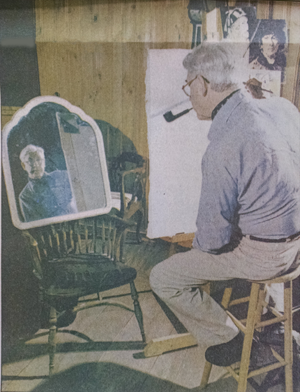 Bob Cain as Norman Rockwell painting a portrait of himself while rehearsing American Rock! in 1994.